Oster Fast Feed vs Speedline: The Difference? For some reason, Oster Speedline seriously went off the radar for some time. Much to my satisfaction, I’m seeing a new wave of interest towards it over the past few months. Let me tell: spoiling yourself with this deluxe machine is fully worth it. However, a few misconceptions float around when it comes to the difference between Oster Fast Feed vs Speedline clipper. The two biggest discussion points are the models’ blades and motor power. Does the Speed Line cut closer? Is it more powerful, or, on the contrary, less powerful? It’s very hard to get a definite answer. Mainly because Oster haven’t given that much info about the Speed Line cutter. We’ve done some research, so bear with us for a quick Oster Speedline vs Fast Feed comparison. 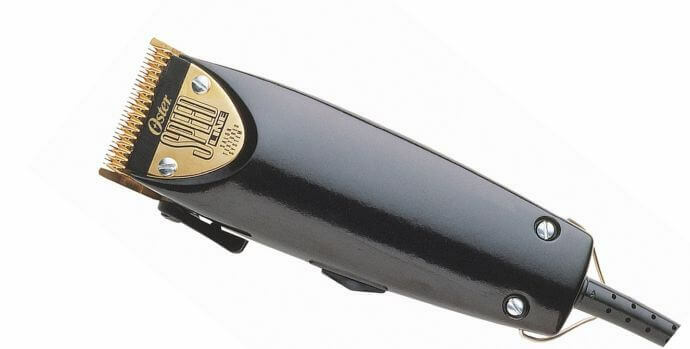 As a few barbers have noted, though, that the blade actually corresponds to the #000 to #1 Fast Feed one. The only difference is its golden-colored coating. I agree. Typos do happen. As it just might have happened when it comes to the Feeds and Speedlines’ motors. There’s so much stuff going around the motor here. Some people say that the Speedline has a faster, more powerful motor. Oster themselves use the same “whisper-quiet pivot motor” trademark for both models. Other people reported that some Fast Feeds have 12 watts slapped on their back sticker, while the Speed Line clippers got only 9 watts. If it’s so, how can anyone say the latter is more powerful? In other words, the motor on both models performs exactly the same. 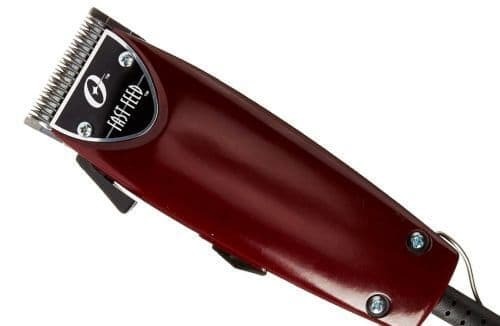 You’ll love how silent and cool it runs compared to other barber grade clippers. Few models can take pride in such smooth operation, really. Entirely up to you. The Speedliner is more of an extravagant pick. It looks way better with that shiny blade compared to the Feeds’ standard one. If you’re a barber, you’ll definitely make an impression on your clients. As we recommended with the stock Fast Feed clipper, you might consider doing a few customizations. First, the three plastic combs + blending guard that come in the Speedline package aren’t that great. Consider upgrading with Andis’ double magnetic guards on Amazon.com for a better cutting experience. Second, you might want to zero gap them and slap an Andis’ coarse ceramic cutter from Amazon.com on the way. Now, that does look a bit more advanced, so I only recommend it to barbers. If you’re a home user, don’t concern yourself with zero gaps and installing a ceramic blade. The purple magnetic guards are a must, though! Even if you stick to easy haircuts you’ll feel the difference…and love it. You can always check our full Oster Fast Feed review — the remarks there hold true for the Speed Line model too! Clippers are wonderful! I mean, Ryan is our certified pro around here, I got acquainted with them due to my diffuse thinning. It’s easy to get hooked on them, though, isn’t it? Just took a look at the Topaz. They seem like a luxury, pimped edition of the Fast Feeds. Maybe something like Andis Master’s limited Black Label edition? I really understand you on the hobby front! I’ve changed a few pairs of clippers just for the heck of it. It can seriously get addicting! We have a Master’s review too when you decide to get a pair of them. Quite heavy for some people, but the cuts they do are among the best you can find with adjustable clippers. Cheers and have a nice Friday!